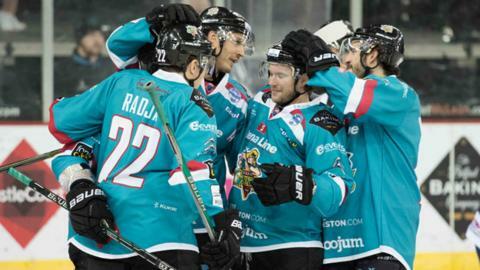 The Belfast Giants kept up their Elite League title challenge by completing a weekend double over Coventry Blaze. The Giants triumphed 5-2 away from home on Sunday night to follow up their 6-3 success at the SSE Arena on Saturday. Belfast player-coach Derrick Walser scored twice in Coventry, with Mike Radja, Adam Keefe and Chris Higgins also finding the net for the visitors. The win was the Giants' seventh in eight games and their next game is at home to Sheffield Steelers on Friday. Belfast now trail leaders Cardiff Devils by three points with three games in hand after the pacesetters went down 3-1 to Braehead Clan on Sunday night. Radja netted the only goal of the first period on Sunday, with Robinson replying with the equaliser in the second period. In the final period, goals from Walser, Keefe and Higgins put the Giants in control, before Pietrus pulled one back. Walser delivered the final blow to snuff out the Blaze.